Flashing is provided, where necessary, to prevent the entry of water through joints between materials. Proper installation of flashing is important, as is the selection of the most suitable materials for each specific location. The minimum recommended weights and types of materials for flashing are shown in Table 31. Aluminum flashing should be Isolated from masonry or concrete or coated with an impervious membrane to reduce the possibility of corrosion. Flashing should be used at the junction of roofs and walls, roofs and chimneys, over window and door openings, in roof valleys and in other critical areas. 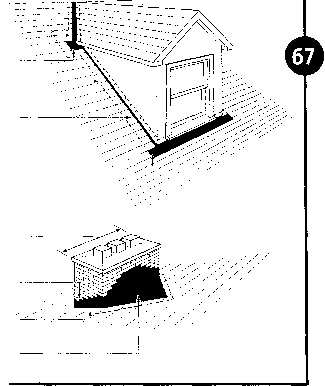 A typical example of construction requiring flashing is at the intersection of two types of materials, as shown in Figure 66. The stucco is separated from the wood siding below by a wood drip cap. To prevent the water from entering the wall, pre-formed flashing is installed over the drip cap to form a drip at the outside edge. The flashing should extend at least 2 in. (50 mm) above this drip cap and under the sheathing membrane. This type of flashing is also used over the heads of windows and doors unless they are well protected by a roof overhang. Where the vertical distance between the top of the trim and the underside of the overhang is more than one-quarter of the overhang's horizontal projection, flashing should always be used. 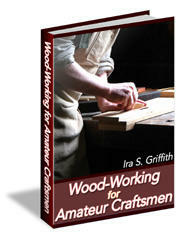 The heads and sills of openings in masonry-veneered, wood-frame walls should be flashed. Head flashing should extend from the front edge of the lintel, up and over the lintel and on up under the sheathing paper. Where a jointed masonry sill is used, the flashing should extend from the outer edge under the masonry sill up to the underside of the wood sill. Flashing should also be used at the junction of roof surfaces and walls. If built-up roofing is used, a cant strip should be provided to avoid a right-angle bend in the membrane and consequent puncturing. The built-up roofing Is carried at least 6 in. (150 mm) up the wall of the house over the cant strip and sheathing. The sheathing paper is then lapped 4 in. (100 mm) over the edge of the roofing. When the siding is placed on the wall, a clearance of at least 2 in. (50 mm) should be allowed between the siding and the roof to keep the siding well clear of water draining down the roof surface (Fig. 67). Where stack-vents penetrate the roof, they should be flashed to prevent moisture entry. Flashing should be used where two roof lines intersect to form a valley. Depending on the shingling method used, valleys are referred to as open or closed. Open valleys are commonly flashed with one layer of sheet metal at least 24 in. (600 mm) wide or with two layers of roll roofing. When roll roofing is used, the bottom layer may be Type S or Type AA mineral surface material (mineral surface down), at least 18 in. (450 mm) wide. Typical flashing between two different materials. 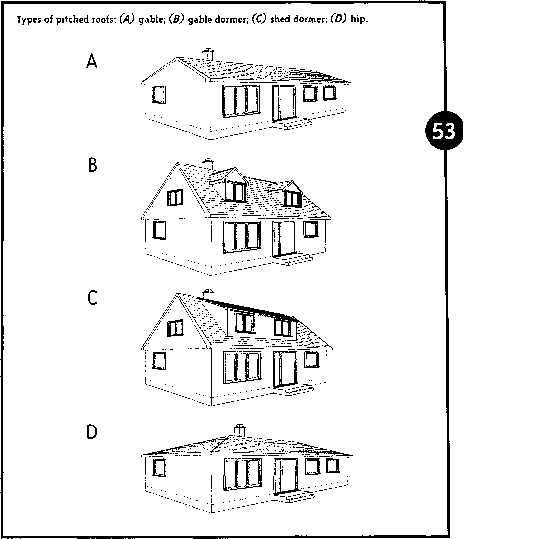 (A) open valley and shingle flashing at side wall; (B) cricket flashing used with chimney that is more than 30 in. (750 mm) wide. shingles are applied. The roof shingles are stopped on a line 4 to 6 in. (100 to 150 mm) from the centre of the valley, this distance being greater at the eaves than at the ridge (Fig. 67A). Closed valleys are generally flashed with one layer of sheet metal, 0.006 in. thick. Each course of shingles is continued across the valley, ensuring that shingle nails are not placed within 3 in. (75 mm) of the valley centre line at the ridge or 5 in. (125 mm) at the eaves. Where rigid shingles are used, they are cut to fit the centre line of the valley, but these should not be used with the closed valley method or roofs that slope less than 1:1.2. Flashing squares (sometimes called "step-flashing" or "shingle flashing") should be used at the intersections of shingled roofs with walls or chimneys. This type of flashing is installed at the time the shingles are applied. One square is used at each course and is bent up along the wall under the sheathing membrane (Fig. 67A). The siding will cover the flashing along the wall, except for the clearance allowed. These squares should be large enough to give a good lap at the roof arid wall line, and the head lap should be no less than 3 in. (75 mm). On the roof slopes behind a chimney, the flashing should extend both up the roof and up the chimney to a point equal in height to the coun-terflashing of the chimney, but in any case not less than 11/2 times the shingle exposure. Counterflashing is used at the intersection of a roof with a masonry wall or chimney. This counterflashing should extend at least 6 in. (150 mm) up the side of the chimney or masonry veneer and be embedded at least i in. (25 mm) into the mortar joint. The counterflashing is fitted tightly against the masonry and lapped over the shingle flashing at least 4 in. (100 mm). Counterflashing is applied to all sides of the chimney where it penetrates the roof. If the upper side of a chimney is more than 30 in. (750 mm) wide, a cricket or saddle should be installed (Fig. 67B). These are often made of sheet metat and should be placed over a wood-framing support constructed during roof-framing operations. The saddle should be suitably flashed at the roof and counterflashed at the chimney. Open joints and laps should be soldered or sealed, or a locked joint used. A saddle is not required, however, if the metal flashing is carried up both the roof and the chimney to a height at least equal to one-sixth the chimney width. This shingle flashing should never be less than 11/2 times the shingle exposure and the chimney counterflashing never less than 6 in. (150 mm).